﻿ Water treatment against limescale and algae in water fountains. What is nice to see is often difficult to clean. Why? water fountains need a lot of feeding water because they lose huge amounts of water due to evaporation. Where water evaporates limescale is left behind and eventually settles. The water quality and the design of the fountain determine where the deposits form. They can either be visible in the whole basin or just in the spray nozzles. not only limescale is a problem but also algae growths excellently. Depending on the environment the amount of biomass getting into the water fountain varies (pollen, leafs, bird droppings). This supports the growth of algae. Despite regular cleaning and chemical water treatment it can be very costly to keep the water fountain clean. Sometimes high-pressure cleaners are used. But for water fountains which are protected as a historic or artificial monument this is not possible. These measures can harm the surface and design. Depending on design and size of the water ring we decide to install one or more Merus Rings at the circulation pump(s). The success of the installation depends also on the type of construction. As soon as the Merus Ring is installed the effect is visible in the water fountain. 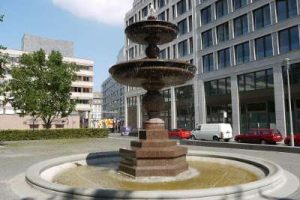 The water fountain in the picture can be found in Berlin, Germany. The place is called „Spittelmarkt“. It is made from red granite and includes three basins – each lies on the to of each other. Directly after the installation we observed that the limescale around the granite became loose. Where the water flows continuously the deposits vanished without additional effort. Algae growth could not be stopped completely. But it was reduced significantly. Also the lifetime of the algae is much shorter. They die very soon, fall off the granite and are collected in the lowest basin where they can be removed easily. Therefore the whole cleaning process was simplified and shortened. The main part of limescale in algae is just flushed out with the water when it is drained regularly. The cleaning works are done in half of the time needed before the installation. No further chemical additives or service is needed.